Crisp veggies, crunchy Fritos corn chips, cheddar cheese and a zippy creamy dressing. 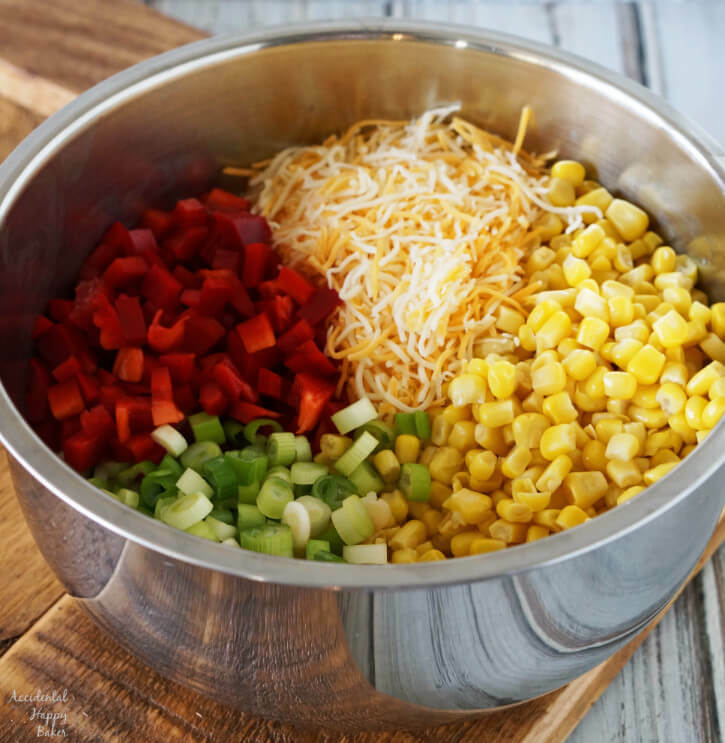 This Frito chili cheese corn salad couldn’t be easier, or more delicious! It feels good to be back into the swing of things and hopefully have a fairly normal week! Last week I put AHB on the shelf because there was just too much going on. 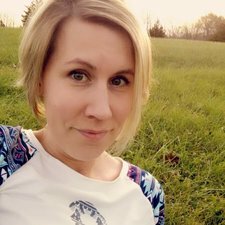 Pet day, 1st grade musical, Middle School Band program, my birthday, a custom cupcake order, a school visit, my daughter’s birthday, my birthday, a Dr’s appointment with a sick kiddo, Mother’s Day, and 2 early morning meetings at work. It was go go go, one of the weeks where you’re just trying to make it to the other side. I know that you can relate. But after this week, we’ll officially be on summer time so it’s time to let loose and relax a bit. Enjoy the slower pace of life. Maybe fire up the grill and have some friends or family over. And I’ve got the perfect recipe for a get together like that. 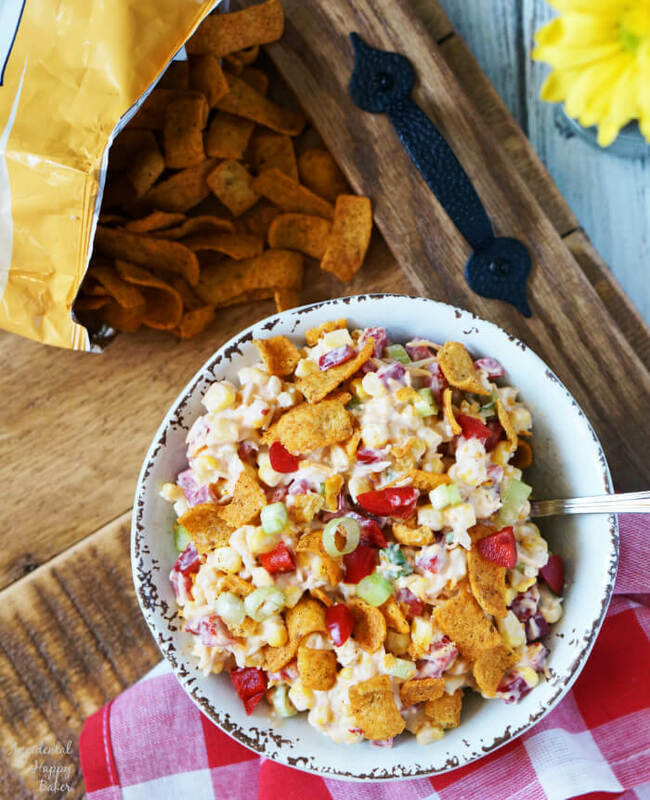 This Fritos chili cheese corn salad is one of my favorite lazy summer sides. 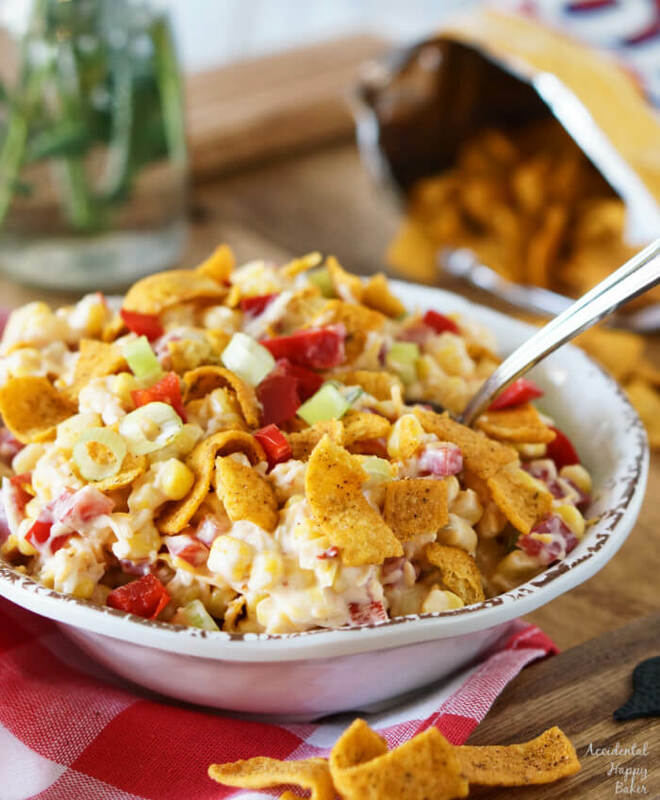 Fritos chili cheese corn salad is one of those combinations that maybe seems odd the first time you try it, but then it’s instantly addictive. If you love corn chips in taco salads then you’ll love this recipe. One of my coworkers brought this to work for food day and I’ve been hooked ever since! It’s a great mix of crunchy and creamy. Canned corn, diced red bell peppers, green onions, and cheese go together with a simple dressing of sour cream and mayo. One of the perks of using chili cheese fritos for corn salad is that all the chili cheese flavoring mixes in and gives what might seem like a plain dressing incredible flavor. I also like to add some adobo sauce to my Fritos corn salad, just to kick it up a notch, but you could substitute your favorite hot sauce if you’d like. This salad is easy to make ahead of time, just save adding the chips until you’re ready to serve it or they’ll turn into a soggy mess! Crisp veggies, crunchy Fritos corn chips, and a creamy dressing. 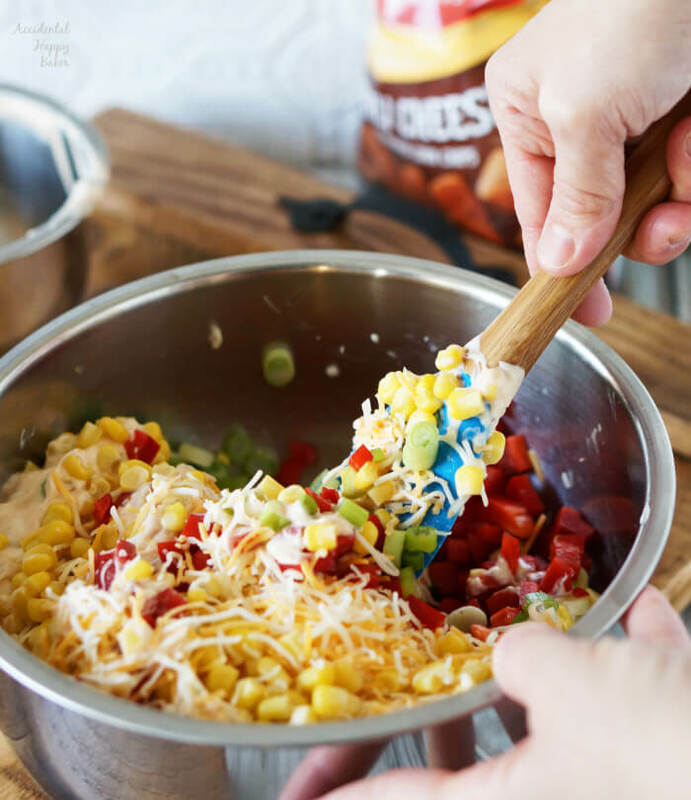 This Frito chili cheese corn salad couldn’t be easier, or more delicious! Drain the corn. Chop the bell peppers and thinly slice the green onions. Add all the ingredients except the Fritos chips and mix well. Crush the fritos chips and stir in immediately before serving. 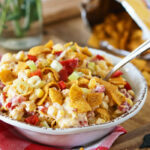 Fritos chili cheese corn salad is my most favorite dish during summer. It is an excellent make-ahead type of recipe. Happy summer! I’m so glad that you enjoyed it! Hope your summer is amazing!